Well, today is not my day as far as “easy” questions go, is it? So, it appears that everyone is curious about fruit and are asking what is the lowest calorie fruit to eat. That question is kind of a loaded one. You see, calories may not be the most important thing to consider here. In fact, when you are looking at fruit as a part of your eating plan you should be looking at sugar content vs. total nutrition. For most fruits (but not all) the payoff is delicious, juicy and sweet flavor coupled with incredible amounts of nutrients packed into a small number of calories. But, if you are eating a strict low-sugar or low-carb plan, then some of these juicy wonders may be off the table for you. Only you know what your exact needs are but let’s take this one step at a time. Have you ever stumbled across some of the “weight loss” ads online that start with never eat this fruit ever again? It is almost always a banana that gets the short end of the stick in these ads and they explain that it is because Mr. Banana, the same fruit that our mothers foisted on us all of the time for the potassium, is straight sugar. Is that true? Well, as it turns the best answer here is not exactly. But first, here is a chart (directly from the FDA website) that outlines the calorie and nutritional values of some of the most commonly consumed fruits. In addition to sugar, most fruits including the suddenly “bad for you” banana pack vitamins and nutrients including the biggie: fiber. Mr. Banana packs a full three grams of fiber or more than ten percent of your daily minimum. Suddenly, the banana does not look so bad, right? There are two schools of thought here on this particular fruit. One group says that the sugar in the banana which is mostly fructose is not harmful at all so eat the banana. The other group says that eating a fruit that is higher in sugar (like the banana) on its own is the recipe for a sugar spike which can potentially lead to weight gain. That group says eat the banana but don’t eat it alone. So, what have we learned? Eat the banana. Seriously, if you eat a banana, then consider it both a fruit and a snack and eat fewer sugar calories for the rest of the day. But, there are other sugars with much lower sugar counts that you should consider as well. Sometimes, it is not what you eat but how you eat it. Blueberries are considered a superfood. A bowl full of blueberries is an awesome breakfast or snack. A slab of blueberry pie is not so awesome. There are many, many ways to eat fruit, some of them wonderful and some of them just excuses for too much sugar and too much fat. Yes, delicious pie, I am looking at you here with your buttery, buttery crust. 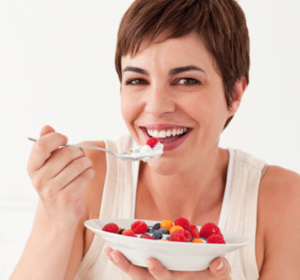 Too many people will take the low calorie counts of their favorite fruits ( blueberries come in at just 32 calories per half cup serving) and they will think it gives them a little wiggle room for extras like whipped cream or a pie crust and before too long they have gone from eating fruit to a dessert. The average calorie count of a single piece of blueberry pie stands at about 360. That is a substantial portion of your daily calorie count, especially if you are trying to lose weight. Before you eat that pie, there are other ways to get the low calorie plus nutritional goodness of fruit without having to suffer. Freeze a serving of grapes. At just 62 calories per one cup serving, you can satisfy a sweet tooth, cool off on a summer day and still not destroy your calorie goals. Berries of all kinds freeze well, too. Again, all berries come in at 32 calories per half cup serving. Make flavored water. Lemons or limes are only 20 calories per entire fruit and will boost your fiber count as well. Both are high in Vitamin C and other nutrients. Lemon water is also good for detoxifying the system. In fact, starting the day with a cup of tepid water and lemon juice is a fabulous way to jumpstart your metabolism and protect your liver. Remember, the simplest rule is this: Whole fruits before fruit juices or sauces or smoothies. See, when you eat whole fruit you have to do the work of chewing and breaking the stuff down. That means that your body is already burning calories before you are done eating. The process of digesting whole fruits also slows the absorption of the sugar so there is less likely to be a sugar spike and the inevitable crash later. Sugar spikes cause insulin spikes which lead to weight gain, to keeping steady blood sugar is very important. Finally, by eating the fruit you are going to get a healthy dose of fiber as well. Fiber not only helps keep you feeling full for longer it also aids in digestion so that everything at the end of the line keeps moving along smoothly. And For the Love of Fruit…Don’t Drink it Out of a BOX! If you drink your fruit in the form of fruit juices you are losing the chewing and breaking down process plus the fiber. So, what are you left with? The answer is the sugar. If you ever compared the calories of a cup of juice to a cup of fruit you might be shocked by how different they are. For one thing, it takes a lot of berries to make a full cup of juice. For another, the delicious, low sugar berry has now become nothing more than liquid sugar and that means a higher calorie count. 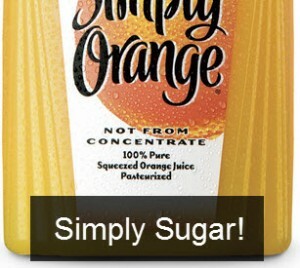 There is no breaking juice down, no need to digest it so the sugar is absorbed into your body very, very quickly. And again, we are back to the sugar spikes = insulin spikes = weight gain merry go round. But,what about smoothies, you are probably asking, gripping the cup of your expensive blender that you bought just for that very purpose. Smoothies can be a good thing-if you are careful with what you are putting in them and you are realistic about their place in your diet plan. If you are heading to the gym and loping along on the treadmill for thirty minutes and then guzzling down a smoothie afterward, you are doing yourself a great disservice especially if that smoothie is being used as a snack between regular meals. Just because you put a bunch of health stuff into the blender does not mean you have a magical elixir there. In saying this, unlike the juice the average smoothie does retain some or most of the fiber. If you blend until smooth but not liquid, you still slow down the digestion process slightly. And you can certainly make lower calorie smoothies especially if you start with leafy greens as the base but watch the additions and the type of liquid you are using to keep things at the right nutritional and calorie level. I personally use the Vitamix 6300 Blender for all my low calorie, high fiber fruit drinks and it will actually save you up to TEN times over buying juice from your local grocery store (and it literally takes a minute every morning to make). Click here if you want to see my delicious fruit & vegetable smoothies I make first hand! Feeling a Bit Woozy? Fruit Can Cure the Blood Sugar Imbalance. Wait! What is that in the sky? It’s a bird, it’s a plane, it’s Super Banana. Okay, not quite, but fruit really can be a wonderful thing. Look, we are all busy- going to work, school and running a million errands. We forget to eat and that can be a problem because guess what that means? Hunger. Unplanned hunger which is the worst kind of hunger. Unplanned hunger is the kind that will make you pull into the drive-thru at the nearest fast food place and get the number 7 with extra pickles, a large fry and a diet Coke, if you please. Fine, then. We are off to the local corner market or wherever greasy chips and over-sized candy bars can be found. A two for one special? Sign me up. I will just “save” this one for later. (Wink, wink.) Before you scarf down your body weight in atrocious food you have to have a plan. If you are going to be out and about, away from your home, you have to plan that at some point you will be hungry. You can either have the plan that says I will eat X food at Y time and that will solve it or you carry something with you. This is where the fruit comes in, stepping up to the plate to rescue you. Fruit, at least most of it is portable. You can throw a banana or apple in your gym bag. You can wash a bunch of grapes and throw them in a baggy or whatever. Fruit is good to have around. Yep, we are about to circle back around to the whole fruit + sugar thing once again. If you have gone to the gym and you have worked out for a substantial period of time you are going to need protein within a small time frame to help heal and restore your body. But, you are also going to immediately need to boost your energy to the point where you are not feeling weak and woozy and that is again where sugar makes its triumphant return. That weak feeling is likely caused by a drop in your blood sugar levels- especially if you did not eat before your workout began. To immediately get blood sugar levels back to a more acceptable, normal level you have to eat something that will be quickly absorbed. Protein takes a while to digest- so you can eat it but it will not help you out in the short term. A quick piece of fruit is the perfect answer because the fructose is easy to absorb and you are still going to get nutrients and fiber. Yes, fruit does have sugar in it but it is naturally occurring sugar. That sugar is counterbalanced with fiber, antioxidants and vitamins, so fruit is a valuable part of your well-balanced diet. Remember to count the calories like you would any other food and remember which fruits work best in the food program that you are following. Excellent article, so many people have no idea how many calories they are consuming when they eat fruit, let alone all the high sugar fruit juices out there. I am a single mother and I am very specific about what I feed my two little ones. They don’t get juice as I don’t want to create bad habits which will trickle into their adulthood years. Juice is bad and eating too much high sugar fruits can actually be bad for weight gain. Everything in moderation is fine, but stay the heck away from fruit juices people…they will make you fat! Totally agree Anne and what you are doing is definitely the right thing to do. I myself have a 15 month old and the last thing we would consider giving here is juice, from concentrate or otherwise. Water/Milk at a young age is all they need and when she does get fruit, we feed her organic fruit that is high in fiber and vitamins. Fruit is definitely not a bad thing and it is far better than anything you can eat out of a can or a box, but if you are looking to trim down you definitely do not want a diet that is too high in sugars. You sounds like an awesome mom and your kids are going to thank you later in life because you have given them the gift of nutrition right from the get go. 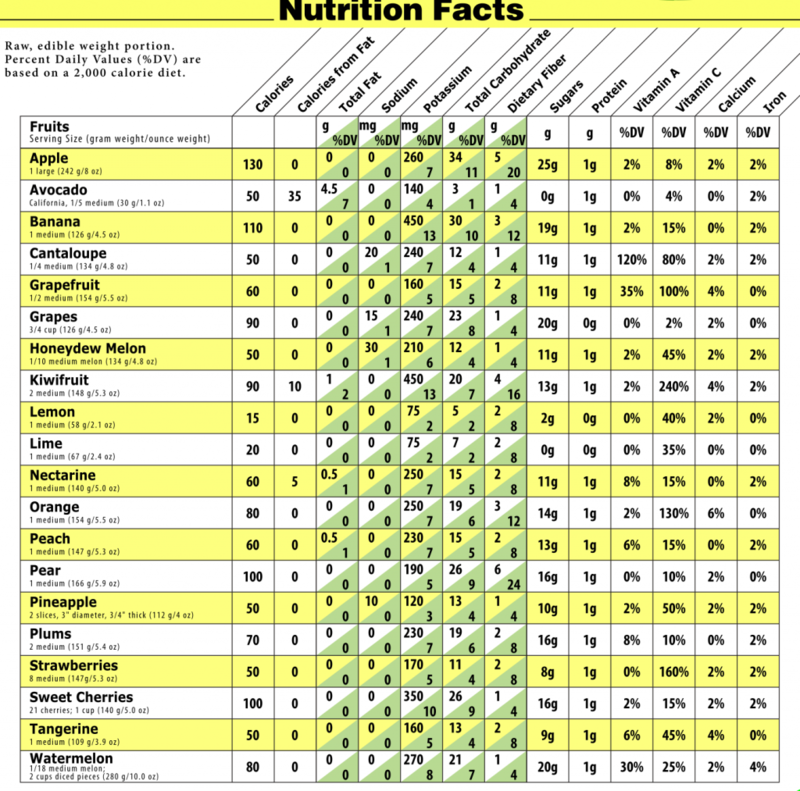 Thanks for the nutrition facts from the FDA, That is an eye opener especially reading through and seeing that the humble little apple has the most calories but the kiwi fruit is 240% in Vitamin C. I had no real idea about the real nutritional values of these fruits. I have pinned the chart into my Pinterest so that I can easily refer back to it. I love fruit juice out of the box, I wish it didn’t have to be so bad for you. I have to stay strong and steer away from it because I have Diabetes and I really do notice that sugar spike if I do drink it. It is not fair. I have to commend you on the frozen grapes. I all of my years I have never had frozen grapes before. But my little boy loves grapes so I buy a box and then stash some of them away in the freezer for my late night snacks. They’re great and now from the chart, I can see why they don’t make me spike at all really. Really useful and educational article. Thanks.